Ganymede was shaped by pronounced periods of tectonic activity in the past, according to a new paper. It’s no longer active and its surface is more-or-less frozen in place now. But this discovery opens the door to better planning for future missions to Jupiter’s other frozen moon Europa. 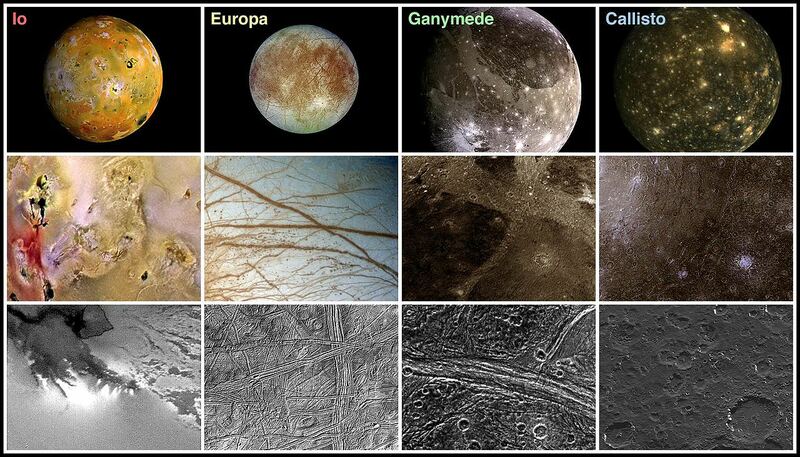 Unlike Ganymede, Europa is still tectonically active, and understanding past geological activity on Ganymede helps us understand present-day Europa. It is a well known fact that the planets of the Solar System vary considerably in terms of size. For instance, the planets of the inner Solar System are smaller and denser than the gas/ice giants of the outer Solar System. And in some cases, planets can actually be smaller than the largest moons. But a planet’s size is not necessarily proportional to its mass. In the end, how massive a planet is has more to do with its composition and density. So while a planet like Mercury may be smaller in size than Jupiter’s moon Ganymede or Saturn’s moon Titan, it is more than twice as massive than they are. And while Jupiter is 318 times as massive as Earth, its composition and density mean that it is only 11.21 times Earth’s size. Let’s go over the planet’s one by one and see just how massive they are, shall we? Mercury is the Solar System’s smallest planet, with an average diameter of 4879 km (3031.67 mi). It is also one of its densest at 5.427 g/cm3, which is second only to Earth. As a terrestrial planet, it is composed of silicate rock and minerals and is differentiated between an iron core and a silicate mantle and crust. But unlike its peers (Venus, Earth and Mars), it has an abnormally large metallic core relative to its crust and mantle. All told, Mercury’s mass is approximately 0.330 x 1024 kg, which works out to 330,000,000 trillion metric tons (or the equivalent of 0.055 Earths). Combined with its density and size, Mercury has a surface gravity of 3.7 m/s² (or 0.38 g). Venus, otherwise known as “Earth’s Sister Planet”, is so-named because of its similarities in composition, size, and mass to our own. Like Earth, Mercury and Mars, it is a terrestrial planet, and hence quite dense. In fact, with a density of 5.243 g/cm³, it is the third densest planet in the Solar System (behind Earth and Mercury). Its average radius is roughly 6,050 km (3759.3 mi), which is the equivalent of 0.95 Earths. And when it comes to mass, the planet weighs in at a hefty 4.87 x 1024 kg, or 4,870,000,000 trillion metric tons. Not surprisingly, this is the equivalent of 0.815 Earths, making it the second most massive terrestrial planet in the Solar System. Combined with its density and size, this means that Venus also has comparable gravity to Earth – roughly 8.87 m/s², or 0.9 g.
Like the other planets of the inner Solar System, Earth is also a terrestrial planet, composed of metals and silicate rocks differentiated between an iron core and a silicate mantle and crust. Of the terrestrial planets, it is the largest and densest, with an average radius of 6,371.0 km (3,958.8 mi) and a mean of density of 5.514 g/cm3. And at 5.97 x 1024 kg (which works out to 5,970,000,000,000 trillion metric tons) Earth is the most massive of all the terrestrial planets. Combined with its size and density, Earth experiences the surface gravity that we are all familiar with – 9.8 m/s², or 1 g.
Mars is the third largest terrestrial planet, and the second smallest planet in our Solar System. Like the others, it is composed of metals and silicate rocks that are differentiated between a iron core and a silicate mantle and crust. But while it is roughly half the size of Earth (with a mean diameter of 6792 km, or 4220.35 mi), it is only one-tenth as massive. In short, Mars has a mass of 0.642 x1024 kg, which works out to 642,000,000 trillion metric tons, or roughly 0.11 the mass of Earth. Combined with its size and density – 3.9335 g/cm³ (which is roughly 0.71 times that of Earth’s) – Mars has a surface gravity of 3.711 m/s² (or 0.376 g). Jupiter is the largest planet in the Solar System. With a mean diameter of 142,984 km, it is big enough to fit all the other planets (except Saturn) inside itself, and big enough to fit Earth 11.8 times over. But with a mass of 1898 x 1024 kg (or 1,898,000,000,000 trillion metric tons), Jupiter is more massive than all the other planets in the Solar System combined – 2.5 times more massive, to be exact. However, as a gas giant, it has a lower overall density than the terrestrial planets. It’s mean density is 1.326 g/cm, but this increases considerably the further one ventures towards the core. And though Jupiter does not have a true surface, if one were to position themselves within its atmosphere where the pressure is the same as Earth’s at sea level (1 bar), they would experience a gravitational pull of 24.79 m/s2 (2.528 g). Saturn is the second largest of the gas giants; with a mean diameter of 120,536 km, it is just slightly smaller than Jupiter. However, it is significantly less massive than its Jovian cousin, with a mass of 569 x 1024 kg (or 569,000,000,000 trillion metric tons). Still, this makes Saturn the second most-massive planet in the Solar System, with 95 times the mass of Earth. 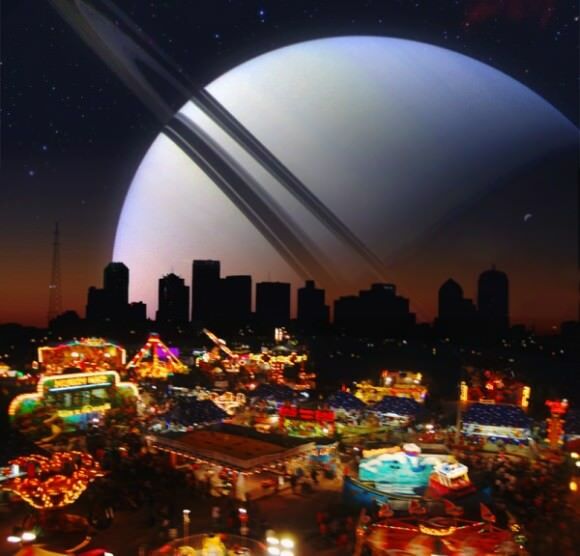 Much like Jupiter, Saturn has a low mean density due to its composition. In fact, with an average density of 0.687 g/cm³, Saturn is the only planet in the Solar System that is less dense than water (1 g/cm³). But of course, like all gas giants, its density increases considerably the further one ventures towards the core. Combined with its size and mass, Saturn has a “surface” gravity that is just slightly higher than Earth’s – 10.44 m/s², or 1.065 g.
With a mean diameter of 51,118 km, Uranus is the third largest planet in the Solar System. But with a mass of 86.8 x 1024 kg (86,800,000,000 trillion metric tons) it is the fourth most massive – which is 14.5 times the mass of Earth. This is due to its mean density of 1.271 g/cm3, which is about three quarters of what Neptune’s is. Between its size, mass, and density, Uranus’ gravity works out to 8.69 m/s2, which is 0.886 g.
Neptune is significantly larger than Earth; at 49,528 km, it is about four times Earth’s size. And with a mass of 102 x 1024 kg (or 102,000,000,000 trillion metric tons) it is also more massive – about 17 times more to be exact. This makes Neptune the third most massive planet in the Solar System; while its density is the greatest of any gas giant (1.638 g/cm3). Combined, this works out to a “surface” gravity of 11.15 m/s2 (1.14 g). As you can see, the planets of the Solar System range considerably in terms of mass. But when you factor in their variations in density, you can see how a planets mass is not always proportionate to its size. In short, while some planets may be a few times larger than others, they are can have many, many times more mass. We have written many interesting articles about the planets here at Universe. 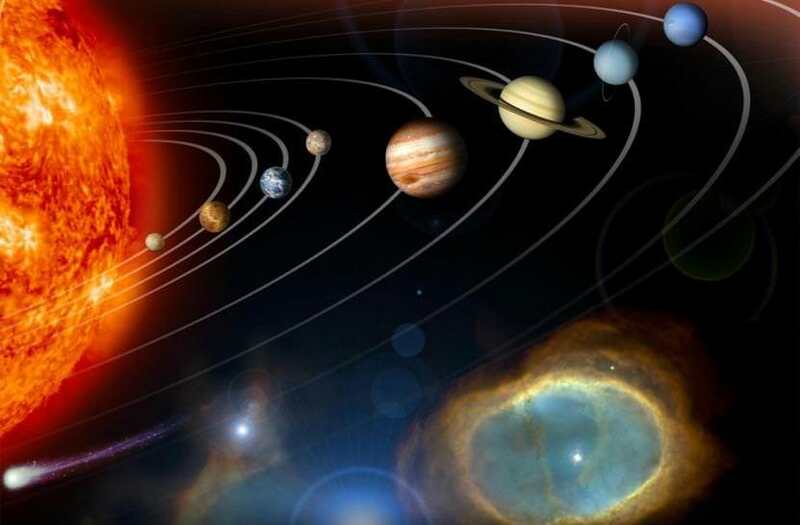 For instance, here’s Interesting Facts About the Solar System, What are the Colors of the Planets?, What are the Signs of the Planets?, How Dense are the Planets?, and What are the Diameters of the Planets?. For more information, check out Nine Planets overview of the Solar System, NASA’s Solar System Exploration, and use this site to find out what you would weigh on other planets. Astronomy Cast has episodes on all of the planets. Here’s Episode 49: Mercury to start!